Deal of the Day: Get BerryWeather for 50% off! 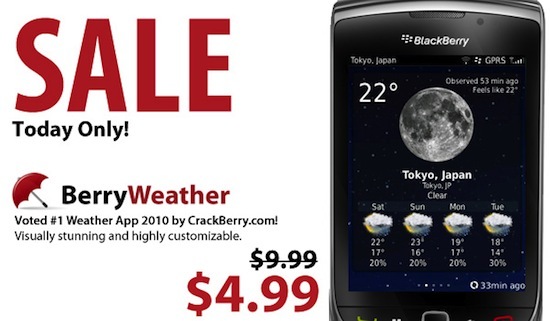 BerryWeather is one of the top weather apps for BlackBerry and is the Deal of the Day for Wednesday March 9th. As one of the Crack Team's favorite apps (and a CrackBerry Awards winner), it gives you a ton of features right at your fingertips. Set multiple locations for weather, see various forecasts, view animated radar maps, get weather advisories and even add a weather icon to your homescreen wallpaper. BerryWeather keeps you in the loop and you'll always know just what the conditions are when you need them. BerryWeather sells regularly for $9.99 but through the end of the day Wednesday you can grab it at 50% off for just $4.99!